Sometimes called the “Nobel Prize for children’s literature,” the Hans Christian Andersen Award is the world’s highest distinction awarded to children’s literature. 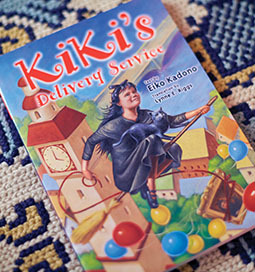 Children’s author Eiko Kadono, who won the author’s award in 2018, discusses her creative environment and behind-the-scenes stories related to writing works such as her most famous book, Kiki’s Delivery Service. Translated into multiple languages, including English, Italian, Chinese and Swedish, and even animated by the renowned Studio Ghibli, Kiki’s Delivery Service has a massive international fan base. The story traces the life of the heroine, Kiki, from age thirteen to when she becomes a mother at thirty-five. The Japanese version is a six-volume series created over the course of twenty-five years, with over 1.5 million total copies sold. 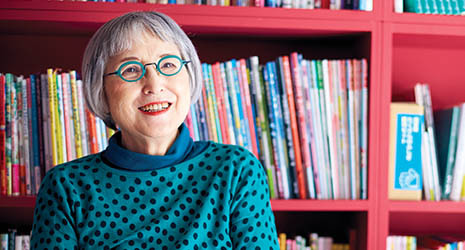 While Kiki’s Delivery Service is sometimes linked to the progress of women in contemporary society, Kadono says that as an author, having “a reader imagine and interpret the story freely represents the best kind of reading experience for each individual,” and wants the series to be read with that kind of freedom. Letters from readers have expressed how deeply the story touched them. They read the book again and again when they faced challenges in a new environment, such as moving from their rural hometown to Tokyo or going overseas to study abroad. As a writer of children’s stories, Kadono believes “the sense of curiosity cultivated in our childhood is what makes us who we are.” Her formative experience with language came through the sound of onomatopoeias that appeared in old stories her father would tell her in a singsong voice. This was after Kadono lost her mother at the age of five. As a girl, Kadono read everything she could get her hands on. In her twenties, she briefly lived in Brazil. She worked hard to communicate with and understand other people in a country with a different language and religion than Japan. This reaffirmed for her the great power of words, which goes beyond just their meaning. It was only as an adult, however, that Kadono discovered her love of writing. Kadono wrote her first book, a nonfiction work, at the age of thirty-four; she made her fiction debut at forty-two. “While there were some hard times, I enjoyed it, so I was able to continue,” she says. “My policy was to avoid setting deadlines but to write each day. I did not leave my desk, and when I could not write stories I did things like writing letters. You set things up physically to ready yourself for writing.” The 84-year-old writer explains with a smile that you first must ensure you are in good health. She adds that she has been a writer for about five decades, yet still maintains her publication pace of one to two works a year. Those who grew up reading Kadono’s works have become parents themselves, and look forward to having their children read the same stories they enjoyed. Along with many of her other representative works, Kadono’s recent book 1945 The Forest Tunnel was highly praised at this year’s Hans Christian Andersen awards. It candidly depicts the loneliness, fear and absurdity Kadono experienced at the age of ten in the days before the end of WWII. “Moving on, I’d like to write about my growth after 1945 The Forest Tunnel. I’d also like to gather manuscripts for horror stories and essays I already have and turn them into a book,” she adds, showing her still-powerful drive to write.